It seems like it’s been a minute since we’ve heard any updates out of Madchild. Well, that just changed, and he dropped info with a vengeance! We just got a press release that not only reveals the album cover to his upcoming solo LP Demons, but you’ll see the track list as well! The Demons album is 16 tracks long, and will be released on April 12th, 2019 on the Battle Axe Records label. On top of all of that, pre-orders are now available too! You can pre-order the album on vinyl or CD. There’s also a jersey bundle option that you might want to consider. Check the press release for all of the details below. Madchild releases the title track from his new album “Demons“, set for release April 12th, 2019 via Battle Axe Records. The effort features Madchild back to spitting the lyrical venom fans are accustomed to, over spellbinding beats from C-Lance, Rob The Viking, and Sean Chapman. “Demons” is available for pre-order now online at https://www.shopbenchmark.com/battleaxe/catalog/category/view/id/1191/ along with limited edition white vinyl, CD, and a limited Madchild football jersey. The album is available for pre-order on iTunes now, and fans who purchase the album now, will receive an instant download of the title track. “Demons” is the follow-up to Madchild’s Evidence produced “The Darkest Hour”, and finds the Canadian emcee aggressively confronting his chaotic past head-on and then using it as a launchpad for new beginnings. 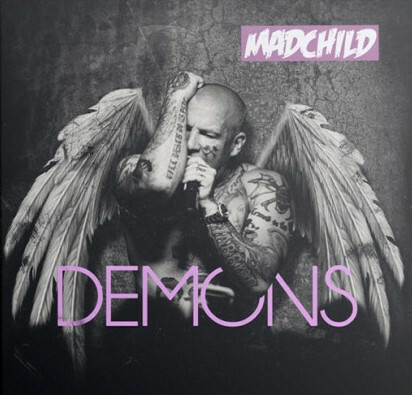 Lyrically, “Demons” offers a hard and honest look at the addictive personality that continues to haunt Madchild, as a war rages inside his head. Crafting his lyrics as a weapon, Madchild prepares for battle, as he dances with the devil to push himself creatively. As a solo artist, Madchild released his debut album, “Dopesick”, in 2012. The album was well received and earned Madchild the #3 spot on the Canadian Billboard Top 200, and #7 on the U.S. Heatseekers Chart, as well as a Juno nomination for “Rap Recording of the Year,” Sirius XFM and Canadian Independent Music Award nominations. Madchild has been featured in Billboard, Yahoo News, Sway’s Universe (Sirius XM), Jason Ellis Show (Sirius XM), B-Real TV, XXL Mag, Noisey, HipHop DX, Complex and many more.